2017 Update: This bag is now in our Workwear Hall of Fame. It’s been loved for years, continues to come out in new colors and sizes, and has stayed under $300. Look for it at Bloomingdale’s and Amazon..
How did you go about studying? I cannot take an in person BarBri class this time, but could do the iPod (is that still even still available – I am so out of touch) or some other self study program. I took California 5+ years ago, but took BarBri and was (obviously) much closer removed from school. I am really concerned that I do not remember anything! Or any bar exam for that matter! Not necessarily just NY. Took CA some years ago, then took NY last summer. I bought the Kaplan books from the previous year and studied on my own by reading and outlining (no lectures). I reviewed my old outlines for the multistate and read/outlined more carefully for the NY stuff. Practice q’s were the most useful–the MBE will already make sense for you, practice NY essays are valuable for learning the NY law and (for me) NY m/c was such a crapshoot that I put my eggs in the essay basket. barbri does all its lectures online now as an option. I took the MA bar but was studying in DC. I would show up to class and watch a video on the big screen. On days where I didn’t want to go I would just watch the lecture on my laptop. I took BarBri 2 years ago and even if you go to the in-person classes you’re watching the same classes you’d have access to through the mobile/self study program. I took NY shortly after taking CA. There are mobile options– not just BarBri but Barmax, which is still expensive at a thousand bucks but significantly cheaper than the big names. Frankly, I didn’t use any class– I studied without lectures or other organized class materials; just good outlines from friends. I reviewed those and crammed for about two weeks and passed. YMMV since I think I was helped by residual MBE memory from having taken CA recently. Generally, though, IMO bar hysteria is way exaggerated– partly because it’s important for a lot of jobs to pass in the summer after you graduate rather than wait to take it again, but also because general law school hysteria bleeds over into bar prep. the exam is a pain (and NY sadly has way more material than CA), but remember– you just need a C-, not an A+, and the NY bar grading curve is not that bad. Why are you taking the NY Bar? If you are admitted in CA and are 5 years out – You can waive in to DC (which has reciprocity with CA) and then use your DC admission to get into NY. It is the easy way out! Don’t do this. I believe to use a DC admission to waive into another state, you’re supposed to have actually practiced in DC. Obviously, if no one at either of the state bars catches on you’re fine, but if they do you could be in serious trouble. This was my understanding as well. I don’t want to get in trouble! FWIW, I waived into DC thinking I could do that, but then was told that you are supposed to have practiced for 5 years in DC. I have been in CA the entire time. Wait! I did practice in DC for 5 years (but have since left). Can I waive into NY? Only if you practiced there for 5 out of the last 7 years. New York won’t count time where you worked/lived in a different jurisdiction as “active practice” in DC. For Barbri Ipod/iphone is still available if you want to do that. What I found the best was watching at home on my laptop. I did my entire NY bar study a couple of years ago at home. The lecture halls were too full and distracting. I had been out of school / last bar exam for 8 years when I took AZ. I saved my old bar bri notes and bought the state supplements from Bar/Bri and just read them on my own. I did practice tests and essays a bit at a time. I passed! And I only seem to study with paper / tactile things. Online wasn’t an option for me then, and I am the sort who needs something to read when I’m waiting for my train. Anybody have experience with lenses for a Canon T4i? I’ve decided that I’d buy a nice lens for my camera and get my sister to take maternity pictures, rather than spending the money on a professional photographer. I just have no idea what kind of lens to get. Any ideas? In case it’s relevant, I like very vibrant pictures. I’ve seen ones where the people’s eyes look really bright and they’re just generally very bright pictures. I’d like to get a lens that will be really useful as the bebe gets older too. Gah, sorry for the multiple posts. I don’t use Canon, but with my Nikon experience, you’ll likely want a 50 mm f/1.8 (to start). The wide open aperture will let you have that soft background, though with such a wide aperture, you’ll have to play with ISO settings a bit if you want back-lit pictures like that (or your photo will be overexposed). I recommend that anyone who has kids get a 50 mm f/1.8 – it’s cheap (as far as lenses go) and you’ll get those beautiful portrait shots you’re looking for. Yes, my friend is a professional photog and he calls this the “baby lens” because it is so good for taking pics of kids. The canon model is very cheap (for a lens). +1 I have this lens for my T3i and it is great for portraits. Just make sure you play with your settings to get the most vibrant colors. Absolutely, get one of these. Gorgeous portraits, easy to use and cheep ($100). And fun. Unless your sister is a photographer, you’re probably better off spending the money on a professional. You can buy any kind of lens you want but if the person holding the camera isn’t skilled at finding good shots, using the right settings for the “look” you prefer, and post processing, then you aren’t going to be happy. My sister is a photographer, although generally fine arts rather than people. But I think she’ll do a great job. And I’m just not that into spending money on maternity pictures. I’m going to pay for newborn ones, but I decided these are a lower priority. These photos were achieved with backlighting and very shallow depth of field. I’d get a 50mm prime if you don’t have one already. An f/1.8 ($100) or f/1.4 ($400) would work great and be really versatile in the future. Your sister will need to be comfortable shooting in manual mode or your faces will be too dark (in the backlit conditions). For what it’s worth (I’m a Nikon girl), I’d recommend looking at Ken Rockwell’s website (just Google his name) and then renting a lens from a reputable lens rental company. Ken Rockwell does pretty in-depth reviews of Canon/Nikon bodies and lenses. And professionals often rent lenses to try them out before they buy, so there are some great lens rental companies out there. I think Adorama and B&H also rent lenses, and they’re about as reputable as you get in photography gear. Yep, my husband rented a telephoto lens from either Adorama or B&H for a trip, and it was a great way to get amazing shots without having to commit to something that’s rarely useful in day-to-day shooting. I have a scenario I could use input on. I work at a firm and a large portion of the work I do is for one company (probably 75% of my billings last year). I am in my 3rd year of practice and am part of a team that services this one company, including myself and some partners. A few months ago this company mentioned to a partner at my firm that they were thinking of hiring someone in-house and did that partner know anyone who would be suitable. The partner asked me if I was interested and I said that I would be. The partner said ok well they might want to hire someone, they might not, maybe we could have you go work at their offices for a year. He left it open ended and didn’t tell me if he passed along my name or not. Fast forward a few months and the job is now posted publically and is asking for a lawyer with 5 years experience. I still think I could be a good fit given that I know so much ab0out this company and have already been doing their work. Should I still apply? Should I ask the partner if he passed along my name or not? I don’t want to miss a good opportunity, but I also don’t want to apply for a job that they might have already rejected me for (say if the Partner brought up my name and the company said no thanks, we’ll post the job). I ALSO don’t want the partner to think I am desperate to leave, or to find out that I applied for the job and didn’t tell him about it. Thoughts on how to manage this? I would just go ahead and apply. If they reject you for not having enough experience that’s unfortunate, but there’s no way you can know that without trying. It would be unreasonable for the partner to get angry at you for applying, because (i) he basically suggested it, and (ii) people apply for jobs without telling their bosses all the time. If, for some bizarre reason, the company rejected you and then told the partner you had applied and the partner confronted you, you would just point out that while you aren’t desperate to leave, he suggested the possibility to you. If I were you, I would go back to the partner first, mention that you saw that they posted for a job, and ask him if he knows anything further/you’re still interested. You seem to have a good working relationship, and you’ve already talked about it as a possibility. If you’re concerned that he’ll think you’re desperate to leave, just say that you’re happy at the firm, but you think it would be a good opportunity. From what I’ve seen, partners generally like to send their people to clients because it can strengthen the business relationship. It seems like based on what you’ve said, the partner would either help you get the job, or tell you that they wanted someone with more experience. Call your business partner in the office, tell them you are applying confidentially. Use your cover letter to explain why your work on their work offsets your not quite meeting the years experience request. I guess my question here is, are you looking for a permanent position or more of a secondment? It sounds like what your partner was thinking originally was more of the latter, and this is your preference as well then definitely work through your firm’s channels. Writing for internet hugs and sympathy. Today is my first day back in the office from maternity leave (baby #2). I left this job as a [email protected]$$ career woman and now all I want to do is run out the door and pick my kids up from daycare to snuggle them all day long. I love the team of people I supervise, but realized I don’t like my boss any better now than I did 12 weeks ago — nice guy, but he desperately needs to go to Chief Executive School. Sigh. No experience in this matter but that sounds rough! Maybe a special treat as a reward for making it through the day? It gets better! I just went back after my second mat leave (Canada though, so 12 months off). I find it’s a big adjustment juggling/wrangling two little ones in the morning, but we’re slowly getting into a routine. Big Big Hugs to you!! The first day — or two weeks for me — back after maternity leave can be so tough. I remember feeling like my heart was being pulled from my body when I left my son. Consider it a major accomplishment to make it through today and this week. If you need to cry, go for it. It will get easier, just not as quickly as you may like or as may seem humane. Other moms get it. Seek them out and lean on them. And then spend as much time as you can tonight cuddling your kiddos. It’s hard going back, but you and him will get in the groove. Take it as easy as you can this week and ideally next week: come late, leave early, focus on catching up rather than making forward progress. Don’t fret about not coming back at 100% on day 1. You’ll be (mostly) back to your former kick bu11 self at the office soon. King Kong wish King Kong had baby to go home to. Hugs to you! I think the first few weeks after maternity leave are simply “survival mode.” I know I existed at work doing what I absolutely had to do and then sprinting out of the office the minute I could to go hold my baby. Good luck! Thanks guys. So — I know I shouldn’t do anything rash in these first few weeks BUT would it be crazy to apply for a part-time (3 days/week) job right now? These don’t often pop up in my field of work and I feel like it would be a concrete step towards being home more often with my kids. Or is that just Crazypants McHormones talking? Others may disagree, but I say go ahead and apply. (Unless this is one of those you can’t turn it down if offered jobs – such as a federal clerkship.) I applied for other jobs while on maternity leave from biglaw and spent my last day of maternity leave at an interview. I ended up turning down the job because my husband and I decided that we were going to leave the big city in ten months, BUT just knowing that there were other options out there gave me a huge mental lift. See what other options you have. If offered the job and once you have details in hand, that is the time to take a step back and see if it would really work careerwise and financially. +1 to go ahead and apply. Many, many people go part-time after a baby and it doesn’t seem like a rash decision to me (especially if its not irreversible i.e. you could go to another fulltime job later on). If you can go part-time without seriously damaging your household finances or your long-term career, definitely do it. I went part-time when my son was a toddler and I do not regret it at all. I “on ramped” this year, now that he is in first grade, and everything is just fine, my career did not suffer. I did not realize this until I went back to work, but working full-time with a kid who can feed himself, dress himself, check his own backpack for needed supplies, and tie his own shoes is way easier than getting a baby or toddler ready for daycare in the morning. The “I can’t do this, I need my babies” feeling will probably pass but it’s never bad to have other options, especially with two little ones. Do what’s right for you and your family, that’s all that matters. Anybody have a good recommendation for a cute, good quality umbrella in the $30-$40 range? I have a Fulton folding umbrella in a fun pattern that has lasted…oh, 3 years? Bear in mind, it doesn’t rain much here, but the umbrella lives in my main purse for 4 months a year and is doing well. And it holds up to windy rain. I was thinking of these umbrellas but couldn’t remember the brand name. I had one that was really cute and it held up for a while but a couple years of very windy rain storms finally killed it. I have found that I only lose cheap, nondescript umbrellas. So for me, unless I “invest” a little in something I will lose it but if I really buy something I like, then I will not break it, lose it, ruin it, etc. At least not as much or as likely. If you’re in a place that gets serious rain and wind, a Gustbuster. The only umbrella that hasn’t fallen apart on me immediately when the wind picks up. You can find them in stores, but also Amazon. Love the bag, love the color. And you’re right, the green is pretty. Yellow, too, but keeping it clean could be difficult. It’s a good thing it wasn’t Kelly green or my credit card would have been ripped from my wallet so quickly! I love the structure of it and the green it does come in is pretty, I’m just obsessed with Kelly green right now. 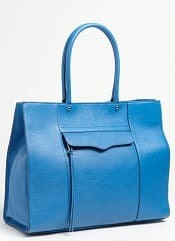 Question about a bag like this. It makes a lot of sense for me as a primary commuter bag for my walk/train commute. It’s a good size for my usual daily load of small electronics, lunch, a smattering of work papers, and personal stuff like wallet etc. But, then, what to do on a lunch run, or other quick errands, meetings, etc.? Take the giant bag? What I do now is have a pretty big zip-up wristlet that acts as my wallet and can also hold my iPhone. But it’s a Kipling – cute and all, but not really much to look at, and doesn’t help if I also have keys. Ideas? I have a leather clutch/wristlet that fits my phone, wallets, id/keys for when I don’t want to take my purse. I got it at the gap for like $20 last year, I think it was their Linea Pelle collaboration, which sadly is not available online anymore as far as I can see. I have a small zippered leather wristlet that functions as my primary wallet and fits my keys, phone and work id when I’m running out to lunch, the bank, etc. It’s basically a leather pouch with a wrist strap (very soft/unstructured). Unfortunately, it’s a no-name brand, so I can’t link the exact one, but there seem to be some options on Zappos. I just carry my big bag. After all, who knows when you might be running out to grab lunch for 5 minutes and suddenly need a Swiss Army knife/hairbrush/keys for an entirely different building/chequebook/novel. At least, that’s how my mind works. I get heart palpitations when all I have is my wallet. I’m the same way and always just take my big bag when I leave the building. Especially when walking somewhere, I get thirsty so I always carry my water bottle. I’m the person that awkwardly holds their two phones/wallet/passcard everytime I run down to get something from the stores/malls. It’s even better when I have a meeting in a different elevator bank, and I have papers too. People must think I’m so disorganized. I clearly to need to invest in a little wristlet. Or more clothes with pockets. On the recommendation of fellow commenters, I just bought the Hobo Lauren wallet and it fits all of my cash, cards and iPhone. You could throw a few (flat) keys in there but not a wad of keys (if that makes sense). I love it and highly recommend! It retails for around $120-ish but I got mine with a coupon for roughly $80. Totally recommend the Hobo Lauren, too! I’ve had the same one for 4 years and I LOVE IT! I use it as my daily wallet, and can fit my keys and phone in it to use as a clutch when running around. 3) Buildup shorter races: I have 2 5Ks scheduled for the summer already. I’ll add a 10K & maybe a half marathon in the fall which will hopefully give me enough time to train. 4) Training apps: Downloaded Couch to 5K and the Zombie Run app – and once I graduate from those, I’m sure there are more? And overall, I’ll keep in mind that it’s a marathon – not a sprint (ha ha ha I crack myself up) and I should just slowly build up to this longterm goal. Thanks so much to everyone for the incredible tips and advice! I haven’t read the morning thread so apologies if this was already said. Please make sure you have really good running bras. I can’t believe how many women I see bouncing around when they’re running. There is no way that’s good for their b**bs and it can’t help their relative positioning as the women age. It seems like everyone makes something they call a sports bra, but so few of them actually do a decent job. If you don’t have bras that will keep everything stationary, they should be able to help with that at the running store too. I also know there have been discussions about running bras here before. Finally, buy some Glide or similar product. You likely will chafe somewhere and Glide will make it so much better. I agree! All of the bouncing makes me cringe. If you have anything up top, in my opinion, you really need an underwire. “Everyone makes something they call a sports bra”–so true! Most of them are like the top from a children’s bathing suit. FOOEY! I’ve learned to look for a firm and thick lower band, and it should be as tight as possible. (Reviews complaining about how annoying it is to take off are a good sign.) Obviously needs vary based on size, but I strongly second the point that you need to be discriminate especially if ordering online. One recommendation, often on super-sale: Fila high-impact running bras from Kohl’s. I recently picked up a Shock Absorber Ultimate Gym Bra. Amazing. Also love the Moving Comfort ones. I think you’re in Boston, or at least in that area, unless I’m mistaken, so for running shoes, check out Marathon Sports. I don’t know how much variation there is location, but generally, they’re knowledgeable and helpful. And this is probably been mentioned, but the Couch to 5K app has a 5K to 10K app, too, for when you’re ready to move up. I am in Boston! I think there is a Marathon sports right near my house actually — I will check it out. Any sense of where I might expect to be $$ wise or what a reasonable price for good running shoes is? In high school, I remember zero joint pain with shoes I’m pretty sure my mom got at Walmart but I think those days are over. This weekend I wore my gym shoes (which have never caused me any pain for TRX or spinning or other classes) and was in painnnnnnnn for several days after my run. It seemed like more than just soreness – my joints felt creaky and painful as well. I’m going to say expect to spend at least about $85 or so. But that will depend on what your needs are. Like you, any pair of sneakers used to be fine for me, then I realized that because of the way I run (I tend to underpronate) if I’m not wearing the right kind of sneakers, my feet and legs will be super unhappy with me. But whoever is fitting you should be able to help you find a good pair so that your poor joints won’t feel so bad. So be sure to let them know where it hurts after you run, and bring in the shoes you currently wear. Usually the wear on the soles will help figure you whether you roll too much inward, don’t roll inward enough, or whatever. Disclaimer: I’m incredibly undisciplined when it comes to running; I’m a fair-weather runner. Literally. Like, when it’s really cold out, or rainy, or the Boston-area streets have deeper-than-they-look-melted-snow-puddles everywhere, forget it. I’ll wait inside for better weather. Yep, this happened to me as well and good shoes definitely fixed it. I paid about $85 – $95 for my first 2 pairs — Asics & Brooks — that I picked out from a number of recommendations at the running store after they analyzed the way I run. Now I keep an eye out for those particular shoes to go on sale (especially since I think they come out with the same ones in new colors every year) and can get them for $45 if I’m lucky. Buy Anatomy of a Runner – it’s an amazing book with all kinds of info for runners. But don’t get scared off by the text. Go straight to the self mobilization and stretch/strengthen pictures towards the back. If you start off on the right foot (see, I crack myself up too!!!) you will be less likely to injure yourself as the miles start to add up. Also, I recommend subscribing to Runner’s World. If nothing else, it’s monthly re-motivation, with loads of great recipes, running/racing/training plans, stretches, and advice… and interesting articles too. I love Runner’s World for the articles and stories but it just drives me up the wall that there’s always a “Lose 10 lbs before summer” headline somewhere on the cover. I know it’s marketing…but geez – some of us just want to drool over running shoes and inspirational stories…I always think the weight loss stuff cheapens it all. Love the pick, but I’m trying to wean myself off of my big leather bags after my chiropractor gave my pretty Shark Modalu Pippa the side eye (she suggested a fanny pack instead). Are plastic claw clips professional? I’m talking about ones like Scunci No-slip Grip Octopus Clip or Scunci Effortless Beauty Basic Jaw Clips (names from amazon). I used to wear them all the time in middle school, and then stopped in high school and college because I thought they looked weird. But I wear them all the time when I’m driving because they’re so convienent and comfortable. My hair is so heavy sometimes! Is it OK for the office? I work in an office with a ton of guys and a male dominated industry, so it’s hard to look for examples of women. I think as long as the color is black or brown, it’s probably fine for around-the-office wear, though I would hesitate to wear them to a meeting with VIPs / clients that was business formal. I wouldn’t call them “professional,” but I consider them acceptable in a professional office without client contact. Check out yoga clips… They have the same ultimate goal but in my mind are much more professional, in large part because they don’t stick out from the back of your head but instead lie flat. Some of the ones in the link below are a little too colorful for work but they have nice plain tortoiseshell or shell colored ones as well. Haven’t been to Costa Rica, but have been to Cozumel, Belize and Grand Cayman at that time of year and the latter two were generally warm enough (low 80s) for good outdoor times. Cozumel was cool and rainy though. I would recommend Ambergris Caye in Belize at that time of year–you can go diving, go inland to the ruins, lay on the beach, eat out at all levels of swank or not. I also recommend Grand Cayman, which I have been to for New Year’s several times, but I mostly dive there. It does have a nice park reserve with blue iguanas, horseback riding, a turtle farm, kite surfing, Stingray City (can be done by standing on a sandbar, snorkeling or diving), beaches, great food, but not the historical interest of the ruins in Belize. Love Grand Cayman but it’s expensive! I’ve been there and to Costa Rica and CR is much more reasonable in terms of lodging, food etc. I went to Costa Rica several years ago in December, and it was definitely warm at the beach! We also visited the rain forest and Arenal. It was cooler and rainier in both of those places, but not bad (and we were in a rain forest after all). I have also been to the Caribbean in December – Barbados, Bahamas, Turks and Caicos, St Maarten, St Barts – and the weather has always been pretty fantastic. Not as humid as summer, but warm sunny days with a few sporadic tropical showers. I thought the fit was TTS. I’m an hourglassy 12-14 — definitely a 14 on top — and the XL fit fine. The length is longer than I like (I prefer high hip level) but that’s in the product descripion and reviews, and a lot of women like a longer sweater. It was not boxy at all but nicely shapely. I have cashmere sweaters from L&T and Nordstrom (the “Only Me” brand or something like that) that are much boxier and fit larger. The merino is a very nice weight, not sheer (unlike some I’ve got from AT that need a cami). It looks like the sale price is $47, still a good deal. I believe BB also is still doing a buy 2, get 1 free deal. I also got my merino v-neck sweater from the BB sale. I’m a pronounced pear shape (I double in size at my waist) and I’m generally a small on my upper torso and a large on my lower torso (why yes, this does make buying everything an enormous pain), the small fit me perfectly all over. The v-neck was very conservatice on me, and I liked the slightly longer length. I wore it all day on Friday (until about 1 am because we went out after work) with no undershirt and it never felt itchy. I also appreciated that I didn’t sweat at all while wearing it, which for me is a minor miracle. I know there are resources out there for checking up on the “bona fides” of various charity groups, but does anyone have any particular recommendations? The backstory is as follows — I’m thinking about donating my wedding dress (after it gets used in a few weeks) to Brides Against Br**st Cancer, since it sounds like a great organization — secondhand wedding dresses are sold and the proceeds are donated to various programs for cancer patients and families. However, I’m wondering if there is a good way to get any transparency into how much of their funds are actually donated, and to which br**st cancer related charities. Since it’s a 501(c)(3), shouldn’t that info be publicly available somewhere? Any suggestions on how you personally “vet” your charitable giving, as well as any thoughts related to this particular organization would be appreciated. Thanks! I should mention that Guidestar should have their IRS 990 form, which is a start. I agree, review the 990 which should be on Guidestar. Or call the organization directly and ask for their most recent 990. If you can, please report back about what you find out about them. I’m curious, because I donated my gown and veil to them after I got married a couple of years ago. I didn’t do any homework like this beforehand. This was the only charity I could find that specialized in wedding gowns. By the way, they ask that you make a $50 donation along with the gown to cover their costs of cleaning it. BTW- I have no regrets at all about donating my gown. My decision came as a surprise to some members of my family, but I was grateful to not have to pay to clean or preserve it- other than the donation to the charity, and I’m glad I don’t have to devote space in my home to keep storing it. I still have the crystal belt and the shoes I wore. Thanks all — guidestar was exactly the sort of resource I was looking for. I also had a good friend who is a 501c3 expert help me look into it, as it turns out to be a bit more complicated than I thought. — They appear to provide services only in FL. BABC is definitely marketed as a national charity. — I’m not sure there’s any real way to figure out how much of your wedding dress donation is given specifically to br**st cancer causes versus used for the parent company at large. — Also, a separate google search shows that a similar organization, Making Memories Br**st Cancer Foundation, got in some trouble for being badly run/not legit, and it moved under the umbrella of BABC. So, that’s a bit sketchy too. Long story short, I think I still want to donate my dress, but am not confident I want to donate it to BABC. Seeking other recommendations if you’ve got them. Where are you located? I donated my dress to a shop in NYC that resells used/donated dresses (and overstock) to benefit charter schools. The shop is called Bridal Garden. Wow. Thanks for reporting back. Lesson learned. I’ll just stick to donating to my church if I can’t take the time to do the research. What about just donating it to a thrift store? TJ – Admin Prof day gifts? I just realized it’s tomorrow and am wondering what people are doing. I did a nice mug + nice tea last year, but want to do something different this year. What do I get for a new assistant that started last week? Something generic if you don’t know preferences, but don’t be cheap. Think of it as an investment in the next year rather than a prize for one week’s work. I take her Empire State Building observation deck at lunchtime. ha, I read this without seeing the name and I was like good lord let her eat her lunch in peace! Usually a bottle of wine and/or a nicer potted plant. My husband and I are looking at hiring a one-on-one childcare provider for our infant (I’ll probably post separately about this in the next few days). This position would be either VERY part-time – one day per week, or alternatively full time M-F. Either way, it would be in our house. They would be doing childcare and also light housework. We’re interviewing our first candidate this afternoon. I have a list of standard questions, but does anyone have experience with this and have any ideas of unusual questions we should ask, or things we should look for, or anything? I’ve never interviewed someone who is going to work for me before. More important if it’s full time, but I”d want to know what she’ll be doing all day. i know infants are boring, but are you OK with her hanging around the house watching TV/reading/doing light housework? Or do you want her actively engaging with the baby? Talk about vacation plans/sick days/time off, how much notice you’ll need etc. Verify reliable transport. Ask about her discipline techniques (and share yours if they’re different, and see if she’s ok with them). If you’re planning for her to be “on the books” you should let her know (a FT nanny may expect this, but a once-a-weeker may expect cash under the table). This ‘on the books’ payment is the hardest part of all this…I wonder how many people in real life just pay their caregiver cash. FT vs one day a week is a whole different kettle of fish, but in my experience you will know right away whether you like the person with your baby, or not. 90% of the people you interview will want to be paid off the books – you should decide how you want to deal with that first. If you pay on the books, you will need to gross up so their net pay is what they are expecting. Also, light housework vs child care – is it just the baby’s laundry and cleaning up baby’s toys? They may want additional $$ if there is more than that. I agree that you will get a sense very quickly about whether you like the person. For us it was telling how each individual reacted to us as parents, to our dog (a giant breed who would be around the house all day) and whether they wanted to hold or interact with the baby. Also, don’t be afraid to ask questions about things that are important to you, whatever that may be. Are you going to try sleep-training/self-soothing? Will the person be ok letting the baby cry? On the other hand, are you against either of those and will the person be ok holding the baby alot? I remember initially feeling very squeemish about asking detailed questions, but bottom line is that this is your kid, ask whatever you need to in order to feel comfortable leaving your kid in his/her care. Good luck! 1. I strongly recommend trial days with you watching her interact with the kid or with you going in and out e.g. you’re working in your room with your door closed but pop out unexpectedly, or can hear if the child starts wailing. A lot of providers can “talk the talk” but when you watch them watch your kid, you realize that they fundamentally do not do what you want. Cant tell you about the number of nannies that did something kooky or NOT OK on a trial day. 2. “What if” questions helped me a lot. e.g. What would you do if the child cried? What if the child refused to eat the mashed banana? Whatever you can think of. It really helps to see what their thought process is and if it meshes with yours. For a minor deviation, I’d suggest what I would do. For a major deviation, well, you’ll know when you hear it. I have no work again and it is driving me up the WALL. No King Kong required!!!!! But King Kong like to feel needed. It’s the worst. I’m exhausted and wish I could be home instead of waiting around for someone to (maybe?) give me work. ONLINE CODE: EP780442 for 25% off entire Coach purchase now through 4/28. Thank you, thank you, thank you! I saved a fortune on something I’ve wanted forever. Anyone have ideas for a hobby I can take up to fill up my boring evenings? I need to come up with something to do for an hour or two at night, indoors, probably in front of the TV. Perhaps something along the lines of knitting or cross-stitch, but neither of those appeals to me because I don’t particularly like the end products. I already work out in the mornings. It would be great to find someone to hang out with, but for now, I’m alone and trying to be productive (or at least not destructive) with empty evenings at home with the dogs. Is there a reason that hobby needs to be at home, indoors, in front of TV? That is somewhat limiting. I agree it is limiting, which is part of why I’m having trouble coming up with ideas. It does not have to be in front of the TV. But I get home pretty late most nights and only get a couple of hours with the dogs, so I like to stay with them most nights. And my neighborhood is not a particularly safe place to be out once it gets dark, whether alone or with someone, with a non-ferocious dog or not. I enjoy making jewelry. Can take intro class at local bead store, and you work with your hands so kind of like knitting etc. Can get $$$ though. But fun and creatuve. You could always knit some blankets and then donate them to a senior center or nursing home. That way it’s productive and you don’t have to keep the end product. You also could knit soft caps for people undergoing chemotherapy. Alternatives: reading, cooking, scrapbooking, sewing, updating rooms in your house (if you took do-it-yourself classes somewhere like Home Depot, you might meet someone too!). OP – when we were knitting chemo caps for Seattleite, I bought a package of patterns that I shared with all of the knitters. They’re really easy and look great. They are done on circular needles in cool patterns (the one I did was a wave patter) and all you have to do is count rows. So they’re good TV knitting patterns – unlike the one I have next to my bed that requires 2 sets of counters to keep track of cable and shaping. Email me at nolar e t t e @ gmail (obviously with no spaces) if you want the pattern book. I bought it for a few dollars from Ravelry and it’s just a pdf. My knitting group used to knit little hats for the NICU babies. Its fun because they are tiny so you finish them really quickly and you can play with different combinations of colours, etc. Seems obvious, but play with your dogs? Nothing cheers me up like a game of hybrid fetch/tug-of-war, followed by belly rubs and kisses. The pup enjoys it too. And I know you said “inside,” but could you add another walk with the wee beasties? May or may not be feasible, depending on where you live. In terms of actual hobbies, could you read instead of watch TV? I always feel better about my life choices if I’m reading something, even if it’s trashy, as opposed to numbing myself with Teen Mom. Other thoughts: drawing or painting, meditation, seriously cooking or baking, getting a lap-loom if you like yarn-y textiles, learning to sew (pillows are easy, but it makes me feel fancy to be able to customize all my throw pillows), starting a blog, taking photos of your dogs. I’m sure other people will have better suggestions. I started an online LLM program to force myself to do something other than watch tv. :p But left to my own devices I would just turn the tv on and play something along the lines of Wordament (boggle type word game on my ipad.) If I want to be productive, there is always cleaning or organizing. Any home improvement or decorating projects you’ve been putting off? I don’t like a lot of the knit products I see people make, but a handmade baby blanket is so awesome to be able to give someone (a friend, family member, or through donations, a total stranger). I also found cross stitch that I actually think is attractive – I love old William Morris patterns that I have found on Amazon, but there is also a ton of patterns on Etsy. Baby blankets are definitely the majority of my projects – relatively small and you see a finished project relatively soon. It also helps that my friends are having babies so I have places to send them. I have some cross stitch patterns that I like (not the majority of them) – I like the Celtic Ladies series from Lavender and Lace – can be a bit intensive/overwhelming if you haven’t done cross stitch before though. Check out Scarlet Quince for cross stitch reproductions of works of art, if that’s more your speed. Or there’s always the Subversive cross-stitch movement. I’m fiber arts gal, soooo… How about crochet? Even if you don’t like crocheted clothing, you can do a lot of other things with crochet (jewelry, baskets, lacy things, etc.) I recommend you check out interweave crochet online, the most recent issue has a lot of jewelry projects and you can see pictures of all of the projects from some issues online without having to buy the magazine. It’s also easier to learn (I think) and can be done without looking down as much as knitting. Alternatively, how about spinning (as in fiber, not the exercise)? You can get a drop spindle (a stick with a disk on the end) for about $15.00 to see if you like it and spin your own yarn. It’s incredibly relaxing once you get the hang of it and you get to buy all the pretty fibers! Granted, it means you’ll have yarn at the end, but you might be able to barter it with knitters, weavers, or crocheters, or even sell it through a yarn store (once you get better). You might also check out Craftsy, which puts on online classes in a ton of different crafts, or the Interweave Press website, which publishes magazines in a lot of different crafting areas. Completely different topic- this might be a little too involved for you, but you could also take online courses on coursera. They have courses in a lot of different areas and it can be fun to take something in an area you’re completely unfamiliar with, since there is no risk of getting a bad grade. Thanks for the great suggestions! I’ve never been crafty, so didn’t realize all that is out there. I don’t own my home, so DIY home renovation is out, but hopefully will help fill some evenings in the future. And maybe I will just go to some of those classes in preparation. This might be super lame – but what about doing a puzzle? I love doing puzzles or doing an easy sudoku or something similar while watching sports games or TV that doesn’t require full attention. It’s also the only time I care for the plants in my living room, but I’m not sure that’s a real hobby. Other crafty projects – cross-stitch, embroidery, small (or large, depending on your level of commitment) hand-sewn projects, scrapbooking, collage, painting, etc. What is your favourite treat that you’re embarrased to buy/eat in front of others? I love Fig Newtons. A lot. But I think they’re not a “cool” cookie. My grandma used to give them to me when I was little, so I guess I developed a taste for them? Whatever, they’re delicious. And pistachio jello pudding. It’s not even that good, and it’s defintely got a fair amount of green food colouring, but I love it. Oooh! Cheetos and Dr. Pepper, but the puffy Cheetos, not the crunchy kind. Sorry, you’re wrong. It has to be the crunchy ones. Orange-stained fingers for the win!! Yep – quick fried for a crackly crunch. Although I did have a thing for the generic cheese puffs years ago. We used to joke that one of my student workers was going to be Cheese Puff Boy at my wedding, carrying around a silver bowl of cheese puffs. He was Cajun and his description of how that was going to work still cracks me up. Yes! Cheetos! And red vines + diet coke in the summer. Somehow, they balance each other out–complementary artificial tastes. I love fig newtons too! They are amazingly wonderful. I love Fritos. I can eat the entire bag and then feel sick and still be happy. Hot Fudge Sunday Pop-tarts. Last time I bought them the cashier asked if I wanted a balloon (the one’s they hand out to little kids in the grocery carts). I have to assume they though I had a kid at home, but I don’t. sigh. What is this “embarrassed”? But I guess I am kind of ashamed my love for Oreos and Doritos. Almost never buy ’em, though, because if I let them in the house (or office, or anywhere within a 10-foot radius of my mouth) I eat the whole package in one sitting. Seriously, I love healthy food, but there’s something about Oreos and Doritos that gets to me. I’m always worried I’ll be mocked for loving Fig Newtons/Pistachio Pudding. They’re kind of old-style treats. Like…when were Fig Newtons and Pistachio Pudding ACTUALLY popular treats? I have no idea, I would assume at least 45 years ago. American Oreos are awesome. I cannot say no to them. Canadian ones..meh, I can take them or leave them. I love Fig Newtons, and I love pudding, but I will admit I’ve never dared try pistachio. Pistachio is the best one! Okay, it may be an acquired taste, but it’s not like jello pudding is all that expensive, so I recommend you give it a try. I have friends who were naysayers, then tried it, and now love it, so…it can’t be that weird. Okay I’ll take your word for it, it’s on my grocery list! I haven’t done this in years, but sweetened condenced milk, with a spoon, straight out of the can. I can still remember when my mom would bake with these when I was a kid and let me lick the lid (such not a good idea with all those sharp edges). So sweet and delicious. FWIW, a fig newton is nothing to be embarassed about it. OMG so yummy. OMG so embarassing that I actually ate those on a regular basis growing up. I used to use the free sugar, butter and saltine cracker packets when I hostessed as a 14 and 15 year old to make a similar treat. No shame! I used to put pizza cheese in a bowl and microwave it, and then eat it with my fingers when it had melted. I also used to eat sugar cubes at church because I wanted a sugary snack. And I would intentionally mix my ice cream with a spoon until it was liquidy, and eat “ice cream soup” for dinner. I may have microwaved it on occasion. I ate coffee grounds as a kid. no wonder i have a caffeine addiction the size of Russia. I’m with you on the pudding. Whenever my husband is gone I mix up a big batch of jello instant pudding and eat it straight out of the bowl in front of the tv. My idea of a great evening! Mmmmm… onion dip. May have to stop on the way home. My roommate introduced me to that onion dip about a year ago and it was absolutely horrible! I couldn’t stop eating it! It’s one of the reasons I’ve lost weight since he moved out (I can’t find the onion soup mix in the grocery store and made him promise not to tell me where it is). I LOVE onion dip. But I will go a step farther and say that I like the pre-made, shelf stable onion dip. Between me and my husband we can polish off an entire can or jar PLUS a large bag of potato chips (with ridges – they have to have ridges) in an afternoon. If I didn’t already have dinner plans, I would definitely be stopping at the grocery store to buy snacks for dinner, including salt and vinegar chips and diet coke and vanilla pudding. My overtaxed brain connected this post to the prior one of a hobby to do in front of the TV. (ie eat food which is a guilty pleasure). Too funny. I think the hobby of eating guilty pleasure foods in front of the TV is what has led America to be the poster child of obesity for the world. It’s only b/c our food scientists are so great at formulating Doritos, Oreos, and that orange cheese product. Yummo! Ditto on all the pudding. I have a weakness for tapioca and rice pudding (what is it about pudding?). I don’t trust myself to keep them on hand, but when I’m sick, they’re my favorite comfort foods. I cannot control myself with rice pudding. I tried to make it from scratch several times, but it is JUST NOT THE SAME. DH hates it. This thread is killing me. Mine is frosted strawberry pop tarts. I used to eat them at work sometimes but only if I was there super early before everyone else because I’d be so embarrassed if someone came into the kitchen while I was toasting them or saw me on the long walk back to my desk. I’m looking for an upright jewelry box – the kind that sorta looks like a closet. ~$30 price range. Ideas? I got one at Kohls a few years ago. It might have been near the holidays though, so I’m not sure if they sell them all year. $30 is a bit low, so maybe try ebay or used shops? Ebay has some nice ones. I know a lot of you have stopped reading above the law and are better for it, but can we have a quick discussion of it here? I have always found Elie to be way, way off with some of the legal things he said. And found out this week (apparently late to the party) that he never actually practiced law. Today he was talking about miranda rights being part of the consitution and my head almost exploded. I thought abl was kind of a business. Like this site, (which I love) I think of as Kat’s site. ATL is more like a corporation I thought, but lately I have been reading such ridiculous articles I wonder if they are doing it on purpose. And that’s not even counting the comment section. No question I guess, just suprised that even someone who went to law school doesn’t understand the Miranda warnings. I remember my legal writing instructor getting mad about Elie but I myself didn’t care that much until his post about Cynthia Wachenheim, which was infuriating, offensive and just horrific. Next time I see David, I am totally talking to him about how ATL is cheapened by Elie continuing to write for it. I find some of the other writer’s columns really helpful and interesting, however and hope that ATL improves along those lines. I remember that. There has been a few articles by him that just had my mouth hit the floor. He seems to be the definition of trolling, and the fact that he is sincere is truly bewildering. I am usually pretty good about reading a blog once and walking away if I don’t like it, but since this is one I used to find interesting and it has slowly morphed into ‘hate reading’ I realized that gradually I have been wasting time reading a terrible site. I thought trolling and sincerity were mutually exclusive. Guys in my high school used to talk to David Lat all the time, it was no big deal. Ugh, your comment made me go and actually read the post about poor CW and oh my lord, what a disgusting person this Elie is, and clearly not too insightful or bright to boot. Every six months or so I end up forgetting how awful ATL can be, click on something and then hate all humanity. Please don’t make Lat get rid of Elie!!! Granted, I haven’t followed ATL all that much lately (too busy, mostly, and now that I’m not in NYC anymore it’s not as relevant most of the time). But a confession: I LOVE Elie’s writing. Love it. I’m not reading him (or most anyone else on ATL) for a correct legal analysis — I have other blogs that I go to when that’s what I’m looking for legal analysis. I read ATL for sheer escapism and humor. And Elie’s writing voice, and his particular brand of general irreverent outrage, kills me. Also most of the time I am right there with him on the whole law- schools-need-fixin’ bandwagon. Granted, my reasons for liking Elie may not be what ATL is looking for — I sometimes think that the problem with the blog is just a lack of unified vision. But still, I would be sad to lose him on my daily RSS feed. I started seeing a guy and really like him. But I’m going through the lovestruck phase–nervous stomach, loss of appetite, inability to concentrate, inability to sleep after sunrise, sadness when I’m not with or talking to him. This is my 3rd round of this in my life and it lasts about a month–very annoying but I will lose 5-10 pounds. Has anybody signed up for girlfriend circles? It’s so hard to make friends as an adult! Has anyone read/followed the Gary Taubes books (“Good Calories, Bad Calories” and “Why We Get Fat”)? A friend is devoted to them and swears it is not just Atkins by another name. I also highly recommend “The End of Overeating” by David Kessler, former head of the FDA. Both authors talk about how the standard American diet is so loaded with additives that it’s quite literally addictive! Love love love Rebecca Minkoff! And this tote is no exception. Fabulous! Why am I crying jealous feeling tears at my desk at work after seeing pictures of a close friend’s brand new baby? What the heck is wrong with me?! You’re in your 20s? Don’t worry, this happens to me too. I know I want kids someday but now is not quite the time, but the photos of the brand new babies on FB are killing me! As long as it isn’t just me! I’ve been so excited about this for so long, and I’m horrified at myself that I am feeling jealous. But I definitely am feeling jealous. Yuck. And this is why I haven’t settled down and don’t have kids. I’ve never, ever, ever felt that way. Ever. Love my nephews, love my friends’ kids, have never, ever, ever felt jealous about them or upset or like I need one of my own. I’m in my late 30s now! I keep thinking that they are probably something that I will want someday and I make relationship decisions along those lines (eg, oh, he doesn’t want kids, we should break it off now), bc I want to have the option to have the future that I think I want – but … when is it exactly that I will want a baby? It’s like the future I think I want is more about the stability and the shared social experience than the actual kid. No advice, just a hug. Nothing’s wrong with you at all. I love looking at pictures of my friends’ babies — they’re so damn cute — but it always makes me sad. I want kids so so SO bad and it just feels so very far away right now (not even close to married yet, haven’t even met the one). Now that I’m about to turn 30, for the first time in my life I’ve lost that confidence that it will definitely, absolutely happen for me someday. It might not (maybe I won’t meet him, maybe I can’t have kids, maybe he can’t, who knows). And so I get sad when I hear about people having kids. And basically any commercial involving children or families. Someone posted something about helping you find the right career that had three questions in it, and the last one was something like “who do you envy most?” For me, it’s people who found the love of their life and have kids. Completely, totally understand. Not weird. Hugs. Question/vent about Admin Professionals Day. In my office, managers get together as a group and celebrate the admins because we don’t have assigned personal admins, all the admins pretty much support everyone in different functions at different times. I, and another manager, brought up Admin Professionals Day in a meeting a MONTH ago and no one wanted to make a decision about what to do at that time. Repeated reminders ensued. Still no action. Finally, today at 3 p.m. there was a frantic call for money, baked goods, flowers etc. so we can celebrate the admins tomorrow. My fellow manager and I are a little irate, and are thinking that next year, we should just do our own thing, make our own plans, and let the slackers figure out their plans (or not) on their own sweet time. Is this advisable, and does anyone else out there do this? I usually prioritize the team player/united front thing, but Admin Day is the same day EVERY FREAKIN YEAR, so we always know when it’s coming, and this last-minute scramble is always what happens. Maybe you can split the difference and make some decisions for next year (ie cake, flowers, card, total budget of $25 per person contributing) and tell the “team” this is the plan, they can join or not. If the admins end up with the same show of appreciation every year, then it isn’t too much to say “this is what we’ve done, this is what we’ll do, feel free to opt out and do something different.” Yes, you will be doing work for the slackers, but they will eventually learn how important it is to keep good relations with the administrators. Not everybody is a planner, and not everybody knows how bad it can get when you make the admins angry, so if you plan and care to keep your admin staff happy and appreciated, maybe you can be the leader on this project. Once you or several of you announce the plan, you become the leaders and can delegate to other people, or if the plan is simple enough, just do it. You will win some good Karma. Thanks for the suggestions. I think our big mistake this year was, we should have just done what we knew needed to be done and not waited. I don’t mind the work in this case as doing the work is infinitely preferable to having angry and disappointed admins! Thanks for the advice. Keep track of any “next year we’ve gotta….” comments you hear now. Yep. I know we will hear several today. Agreed! Same with $150 sweaters. Emergency averted! I called back three hours later, got a different helper, a different answer, and the 25% discount!!! Hello Rettes, I hope this isn’t too late today. I saw the purse (totally gorgeous) and it reminded me that I need hive help. I’m traveling a lot this summer and will be doing a variety activities. Working, touring, camping? Mainly working and touring. So, I am looking for a bag that can carry a laptop when needed, and also lunch supplies, but could be used to carry cameras and trinkets and shopping in markets. Ideally one bag would cover my whole trip (10-12 weeks in South Africa). Other requirements (or ideally-s) are zip top or patch top with locks or clamps so it’s not easily pick-pocketed. Inside pockets for phone, pens, papers, etc. Does not need to have it’s own laptop sleeve, but can have one. Outside pockets for random papers or water bottle would be great (the whole thing doesn’t have to be locked up and inaccessible). I’d really like something that can be cross body or a regular tote, but that’s not a deal breaker. And importantly, it should not stand out too much. As much as I love fun colors, I think I need to stick with black, gray or brown for this. Basically I think I’m looking for the perfect traveling/daily commuter purse, and I hope that some of you have found your perfect one. Cheaper is better for my budget, but it shouldn’t be falling apart with a lot of stuff in it. Logos are a no, don’t want to announce how much I paid for the purse. Oops, maybe more like this one since you want to hold a laptop.